Handmade Valentine's Day Gifts ~ For Spouses, Teachers, Friends, Co-Workers, Etc. Warm someone up by adding a handwritten note to a tea bag. 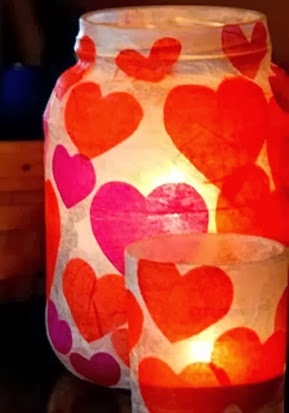 Cut two hearts out of red construction paper using a heart-shaped crafter's hole punch (available at crafts stores). Use a metallic pen to write a short message on one of the hearts. 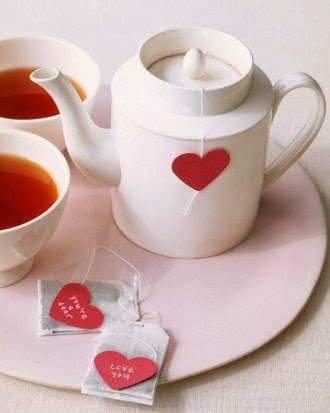 Next, remove a tea-bag tag and, at the end of the string, affix two hearts, back-to-back, using double-sided tape or a stapler. Package bags to give as a present, or steep one in hot water and serve. Remove the labels with the help of Goof Off. 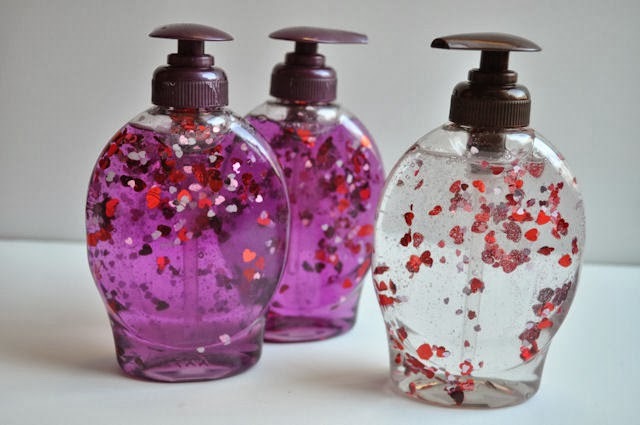 Once the container is clean and free of debris, gather up the heart confetti and dump some in. Replace the lid and shake, It’s a good arm workout! 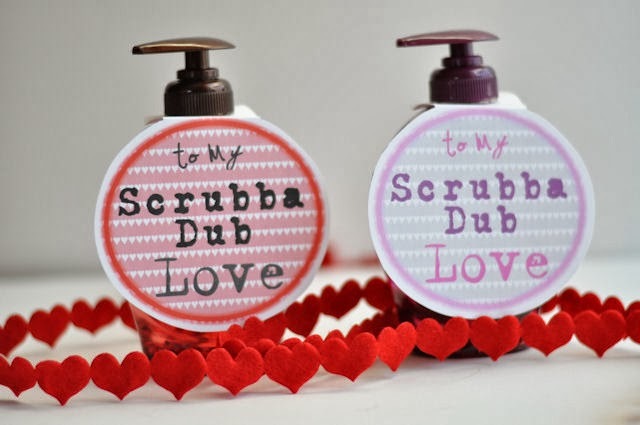 Attach the Scrubba Dub hang tag and your ready to gift it! Who doesn't enjoy the warm glow of candlelight? Apply Mod Podge to clean glass and start applying tissue paper. Rub or smooth out paper as you go. Let dry and plump in your candle. Using fabric shears, cut a 4 1/2-inch-diameter circle from a piece of felt. Cut a piece of matching ribbon slightly shorter than 4 1/2 inches. Using wire cutters, cut a piece of floral wire slightly shorter than the length of ribbon. Using craft glue, affix the wire to the middle of the felt circle. Glue ribbon on top, covering the wire. Let dry 30 minutes. Fold the felt circle in half, using the wire as a guide, so ribbon is inside cookie. Next, angle the sides toward each other, bending the wire at its halfway point and forming a fortune-cookie shape, as shown. Assemble the fortune cookies. 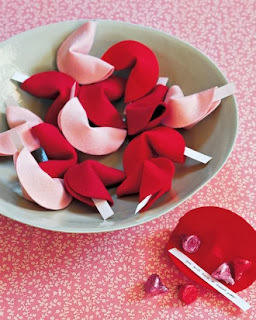 Carefully peel back one flap of the felt cookie, and insert a paper fortune and a few candies. Fold the flap back over to close cookie around contents. 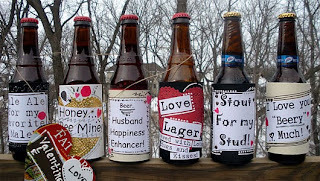 Your Imagination for "Love Messages"
Create your messages on the computer, print them off and affix to your beverage bottle. A reusable coffee-cup sleeve will protect fingers from piping-hot joe -- and the environment from yet another discarded cardboard java jacket. Download the template. 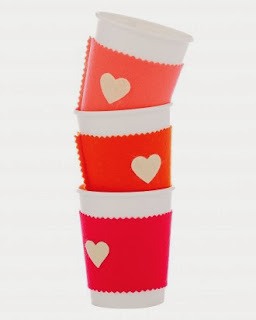 Cut felt with fabric scissors, wrap it around a coffee cup, pin in place, and slide cup out. Machine-sew closed; trim seam with pinking shears, leaving 1/4-inch excess. 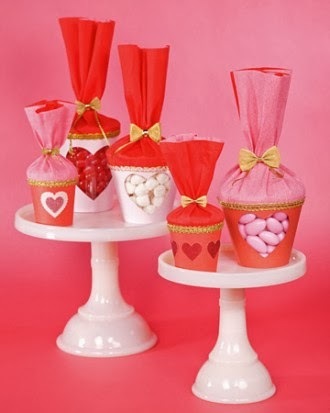 Cut out hearts with scissors; glue to sleeve. Cut scrapbook to size according to your can. 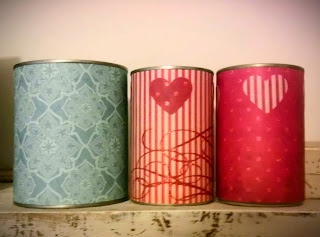 Spray your can with the spray adhesive and wrap paper around. Add in pens and pencils and attach a sentiment. Print your chosen template on card stock. Cut out with scissors. Punch along dashed line edge with edge punch. Cut out heart shape from center of card stock piece with a craft knife. Wrap card stock around cup and secure with double-sided tape. Tip: Gently curve card stock with your hands first to avoid the paper cracking and folding when wrapped around cup. Cut a 12-by-12-inch piece of double-sided crepe paper in half. Place double-sided tape along one long edge and wrap this edge around top of cup. Glue gold trim around cup where the crepe paper meets the card stock. Fill cup with candy. Gather crepe paper and tie closed with gold rope. Add embellishments.